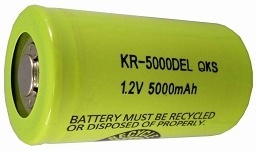 5KR5000DEW: 6.0 volt 5000mAh Ni-Cd Large-scale, rechargeable long life receiver battery pack. 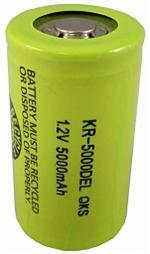 Made with Panasonic KR-5000DE "D" size cells. Weighs over 1.5 pounds. Choose Pack Shape, and choose wire leads or Connector from menus. Flat pack size: 6" long, 2.2" tall, 1.2" thick.